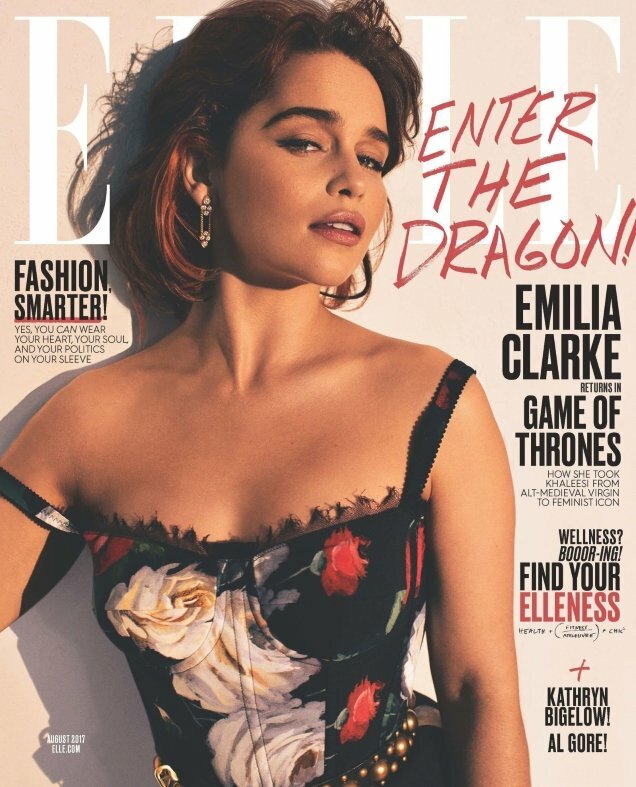 Our forum members have been pretty tough on some of Emilia Clarke’s past magazine covers, including awkward images for Glamour and British Harper’s Bazaar. Thankfully, her latest, the August 2017 cover of ELLE, is a vast improvement over previous appearances. Photographed by Alexi Lubomirski, Emilia gives us major Sophia Loren vibes, vamping it up for the newsstand cover (below) wearing Dolce & Gabbana. Despite Emilia’s beautiful photo, the cover failed to captivate the majority of our forum members. “It looks odd. Enter the Dragon? Really?” quipped MON, suggesting he would have ditched the obnoxious cover line. “Always happy to see Emilia, she’s such a babe and is actually talented too. The Enter the Dragon is just weird, though,” echoed SallyAlbright. Benn98 was quick to disagree. “Oh, my! Some Italian sensuality. This shot reminds me of a younger Gina Lollobrigida, love it. I hope it comes with that filter, makes it look interesting. I’m very amazed that it ended up US ELLE of all magazines who played up to her sensual old-school strengths, and made her look stunning. Good job!” he commented. “Without question the best she’s ever looked in print, in my opinion. This cover is sublime! I love the attitude she’s serving, the Dolce is perfection on her, she suits this styling magnificently. Love this! And genuinely relieved to say that, honestly, because I adore Emilia and I think she’s gorgeous but neither her charm nor beauty have translated to print work so far. Until now, that is,” expressed a clearly delighted happycanadian. See more from Emilia’s ELLE cover shoot and join the conversation here.